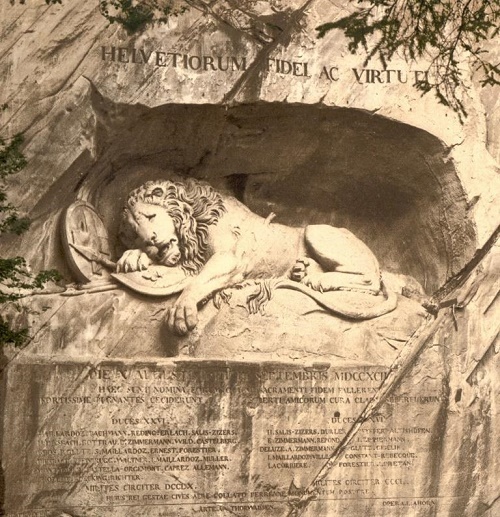 HELVETIORUM FIDEI AC VIRTUTI, which means «Loyalty and courage of the Swiss”. And the below bas – Latin numerals 760 and 350, corresponding to the number of dead and surviving soldiers. At the foot of the monument – carved the names of soldiers and officers who gave their lives in the name of duty. 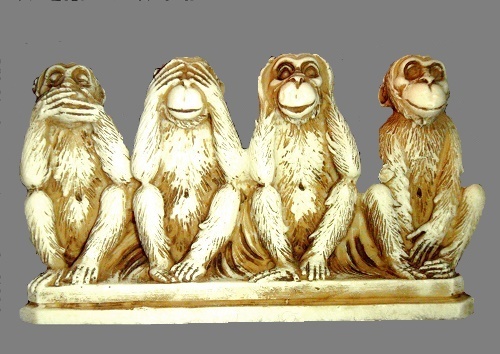 Many of us are familiar with Three wise monkeys representing Buddhist religion principle of non-doing three evils. In particular, “see no evil”, “hear no evil”, and “do not speak of evil”. Monkeys Mi-zaru, Cica-zaru and Yves-zaru “hide” from evil, closing the mouth, eyes and ears. And we often meet their images in sculptures and figurines, as well as copied and parodied ones. However, they also have a fourth friend, whose image we meet much rarer. Meanwhile, forgotten Sedzaru embodies the principle of “do not commit evil,” and the arms cover belly or crotch area. Since the Japanese consider the number 4 unlucky, fourth, though the most important monkey, is mentioned very rarely. Undoubtedly, the four wise monkeys have become the real inspiration for artists and craftsmen all over the world. The Monument to laboratory mice for their services to science was installed in the square not far from the local Academic Institute of Cytology and Genetics of Siberian Branch of the Russian Academy of Sciences. 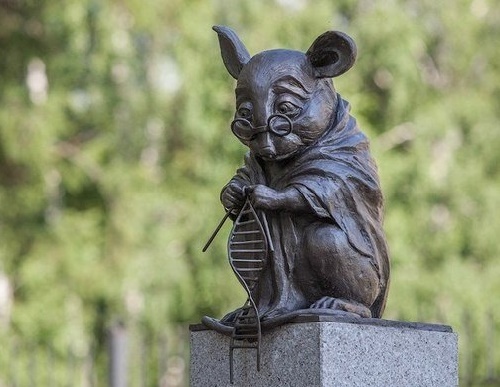 The bronze monument shows a mouse in a lab coat and glasses, knitting with needles the DNA double helix. The monument was opened on July 1, 2013, to the 120th anniversary of Novosibirsk. According to the Institute Director, Academician Nikolai Kolchanov, a monument symbolizes the gratitude of the humanity for the animal, for the use of mice to study the genes of animals, molecular and physical mechanisms of diseases, development of new drugs. Sculptor Alexey Agrikolyansky, who embodied the idea into life, admitted that to do this was not easy, because the mouse is not a human, and it was necessary create it with emotion, character, find a cross between a cartoon character and a real mouse, and keep anatomical parameters of it. 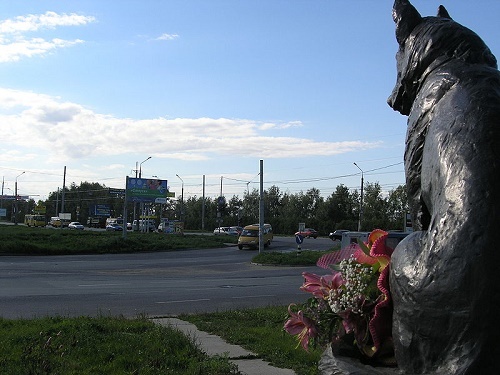 In Tolyatti is an amazing monument of German Shepherd, not forgetting his owners after their death. Faithful Dog Monument appeared in 2003. Its sculptor – Oleg Klyuyev. The story behind monument is as follows: for seven years the German Shepherd, named by the locals Verny (Faithful), lived on the sidelines of the South highway, where his owners died in a car accident. The dog was in the car too, but miraculously survived. Since the tragedy the dog, apparently hoping to return home, in any weather all year round was waiting for them on the road. The locals called the dog “Faithful”, and the most compassionate citizens even tried to take him home, but every time he returned to his post. Several times people built a booth right beside the road, but he ignored convenience. The only thing he did not refuse to take from the people – food, that many of driving along the Southern Highway left for him. Probably, there was no man in the city, who would once have not stopped by the dog and gave him a piece of goodies.